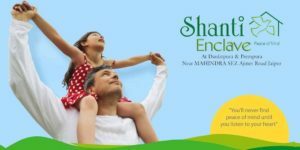 Promoters of The Sscheme “Shanti Enclave” belongs to known ‘ Baid Family’ of Jaipur.Family members are well known in Politics , social work, sports and entrepreneurship. Near MAHINDRA SEZ Ajmer Road Jaipur. Promoters being engineer from prestigious MNIT of Jaipur, have taken keen interest in the development of infrastructure. rain water harvesting, park development etc.